Huge yellow iris with an irregular edge on a medium black border. Large diameter, truly striking. These large contact lenses derived their name from a member of the big cat family - tiger. 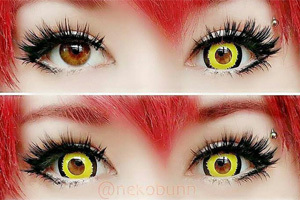 ColourVue mini sclera Tigera contacts are yellow, just like tiger's eyes and they feature a black outer ring, which is meant to resemble a dark cat's mask. Thanks to their 17mm diameter, they provide a convincing cat's eyes effect, not achievable with regular sized contacts.